The brother of murdered Ballymena man Robin ‘Rab’ McMaster has said he’ll be sadly missed by everyone who knew him. The 40-year-old was found dead at his home in the Devenagh Court area of the Co Antrim town last Thursday. Police say a post-mortem examination has been completed and they are continuing to treat his death as murder. Mr McMaster’s younger brother, Richard, said he and his family have been left “devastated” by what happened. “He was a good fella who would have done anything to help you. He would have given you his last penny out of his own pocket, that’s just the sort of fella he was. He was always very helpful,” Richard told the News Letter. Describing his brother as “a big Ballymena United supporter”, Richard explained how he was a member of the Seven Towers Supporters’ Club and a regular at the club’s matches home and away. The 38-year-old revealed that the team’s supporters plan to pay their own tribute to their friend at tonight’s Co Antrim Shield semi-final match against Linfield. “There is going to be a minute’s applause in the 40th minute, as that’s what age Rab was. I hope to be there for the first half and be part of it,” Richard explained. Rab McMaster, a former pupil of Cullybackey High School, had previously worked as a painter and decorator. Mr McMaster’s funeral service will take place at Logan’s Funeral Home, The Diamond, Ahoghill today at noon. 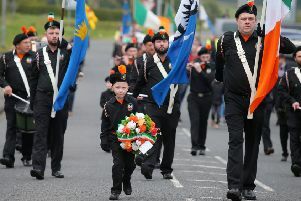 He will be laid to rest in Ahoghill New Cemetery. • A 53-year-old woman arrested as part of the investigation into Mr McMaster’s death has been released on bail pending further inquiries. Angela May Jean Irwin also appeared at Ballymena Magistrates’ Court on Saturday, accused of falsely ordering prescription medication. A police officer told the court he could connect her to the charge. Ms Irwin, of Devenagh Court, was bailed to appear in court again on November 29.